The storm has come and gone now. Juno. Two snow days this week and more snow on the way this Friday! We just got in a little while ago from continuing the cleanup, and there is more we should do, but just can’t get to right this minute. The blowing and drifting were epic. Even though the snow was as light as can be, 2+ feet of it was still quite heavy to move with a shovel. 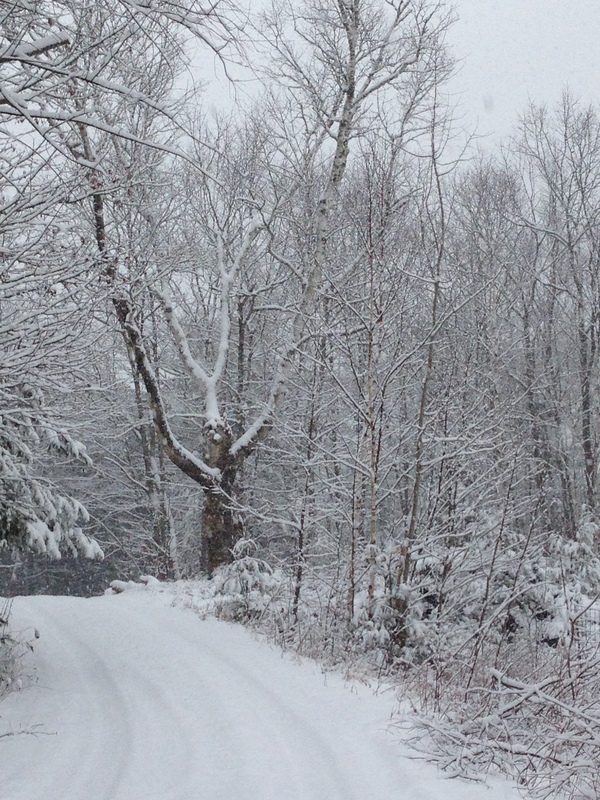 The snow is beautiful and we can’t really complain about anything. We are warm, dry, and never lost power. I worry about the animals not drinking enough water, and we did give everyone some warm molasses water today, but the winter cold with great windiness is a tough one. 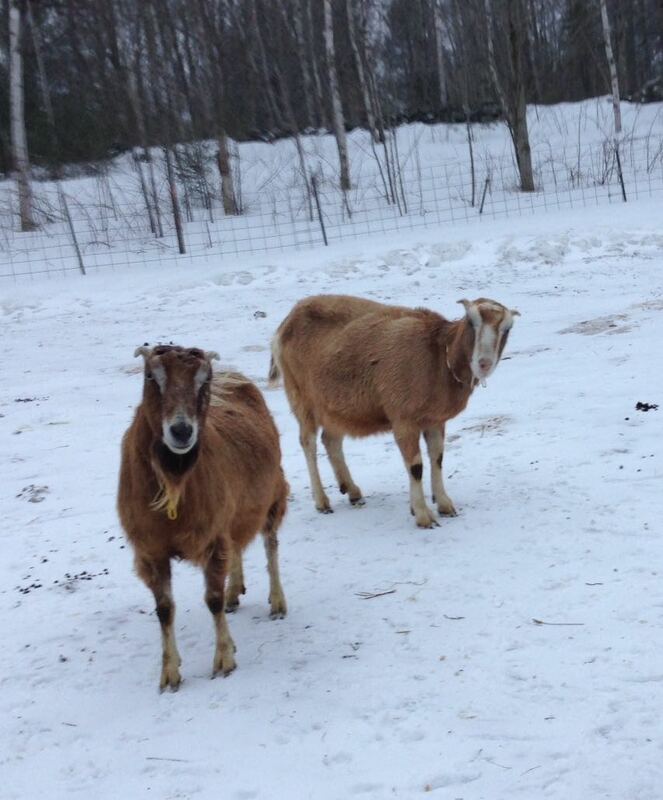 All the goats are doing well, however, and they are hunkering down together and weathering the storms pretty well. And so it goes. One day at a time! Winter has definitely decided to make up for lost time. We were extremely lucky all autumn and early winter with mild temperatures and not much snow. A few bad power-outages and trees down, but multiple feet of snow on the ground, not. Up to 3″ of snow an hour tonight and all day tomorrow will add up quickly, that’s for sure. The coast, where we are, looks to be hit the hardest with 16-26″ of snow predicted and sustained winds of 35+ mph. Our school district has already called a snow day tomorrow, which makes me a very happy camper… I don’t have to get up at 4 a.m. and hustle through, only to stagger in from chores and find that things have been cancelled. Phew! That definitely takes a load off my plate! All the goaties are tucked up tonight with extra deep beds of clean straw and as much water as their stock tanks will hold. I moved all their grain troughs and pans into the hay greenhouse, as I don’t think I will be able to find them in the morning (I turn them over and stand them up after each feeding, but I don’t know if I would be able to find them in the snow!) We have lots of firewood in the house, the generator is tanked up and there is extra gas in the garage, flashlights are charged, and a giant mess of chili is in the fridge to sustain us (along with some wonderful loaves of John’s semolina bread!). We are as ready as we can be. Bring it on! Stay safe out there, peeps. The Thunder Snow is on its way. Our very large Harman 300. I think it is up to the job! All in and running! Of course, neither of us thought ahead to the fact that the lovely new metal stove carcass has a finish on it that needs to get burned off, so when I stepped in the back door this afternoon, it was to a disgusting, lingering chemically smell in the air. 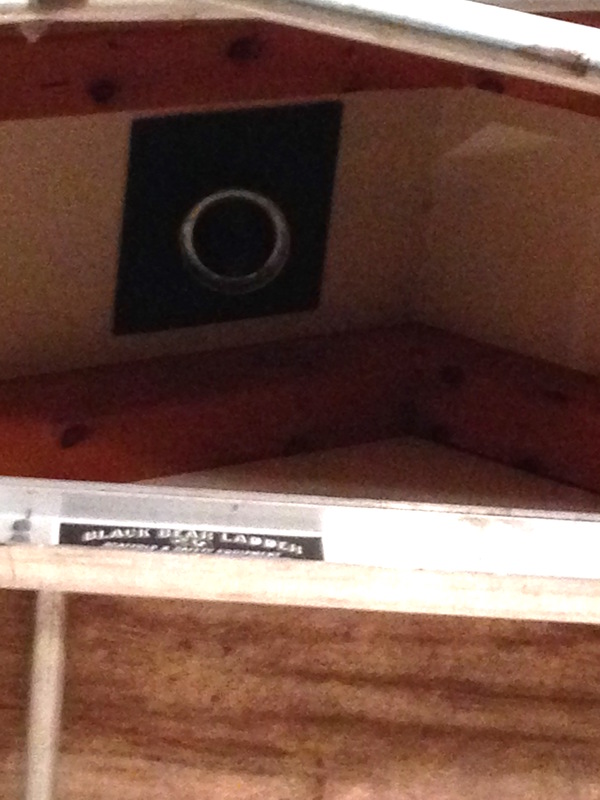 It wasn’t smoky in the house, but the stuff burning off just hung there in the air. So we have windows and fans going, and it is already clearing up, thank goodness. 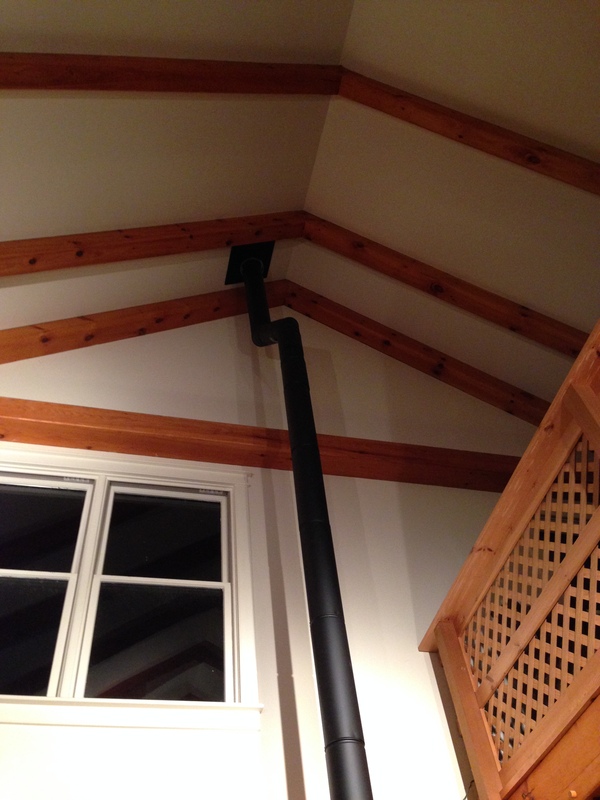 Double-walled stove pipe, filling up that empty hole in the roof! 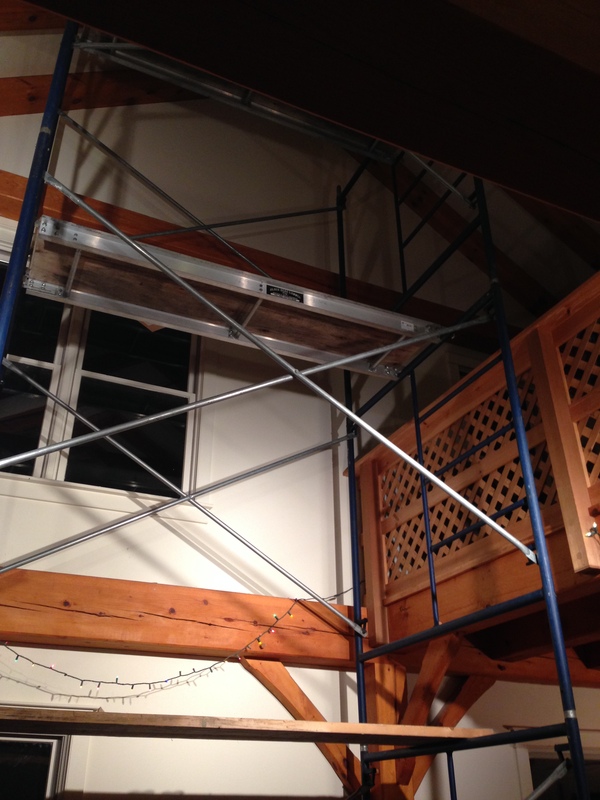 And last night John did get the gumption up to climb on the scaffolding and shove a large bath towel up the open pipe, with a broom handle! Much better. I got home late this afternoon to a hole in the roof. The installer finally came to begin putting in the woodstove. It’s kind of complicated in that we need to have the stove pipe go up two stories inside the house and then exit through the roof. My husband said that it took them quite awhile to get the staging set up, they got the stove onto the tile pad, and then they did the exit pipe through the roof. John was outside helping a friend with something, and the workmen left, telling him they would see us in the morning. I came home and admired the progress and asked what was blocking the hole in the roof for the night. Hmm, no one had really thought about that. John is talking about stuffing it with a towel, but I am not anxious for him to climb that staging. We may just have to put up with the drafts for the night. Hope the morning comes quickly and they get this job done. My arthritis is looking forward to that lovely wood heat! Friday evening finally. The week has been a little bit of a challenge with the snow on the ground and the wind that has picked up. The temperatures are plummeting tonight and I am happy to be inside and out of it. 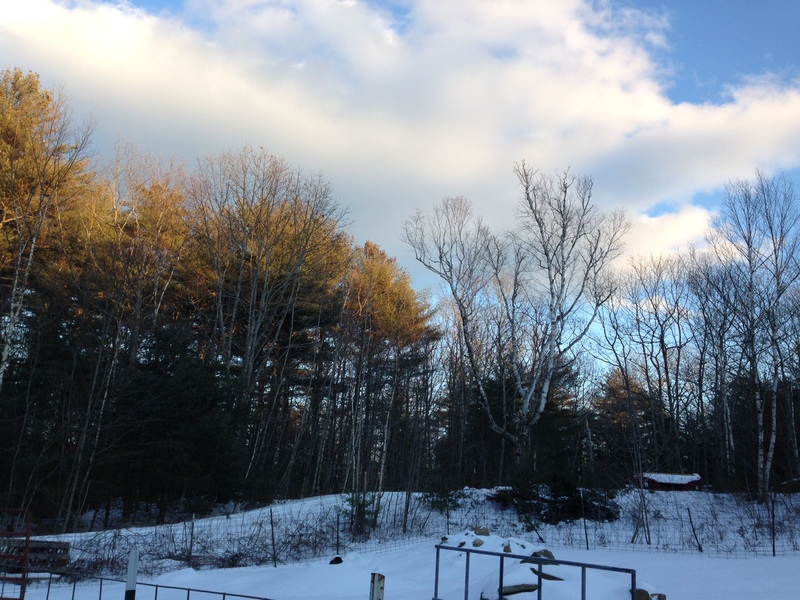 I did chores around 3:30, and as the light was going, the wind was howling, and I came in feeling like I had been beaten up or run down by a truck. The girls are staying close to each other and Zorro the Llama in their end of the greenhouse. Hunkering down tonight is the name of the game. So the Martin Luther King weekend begins. 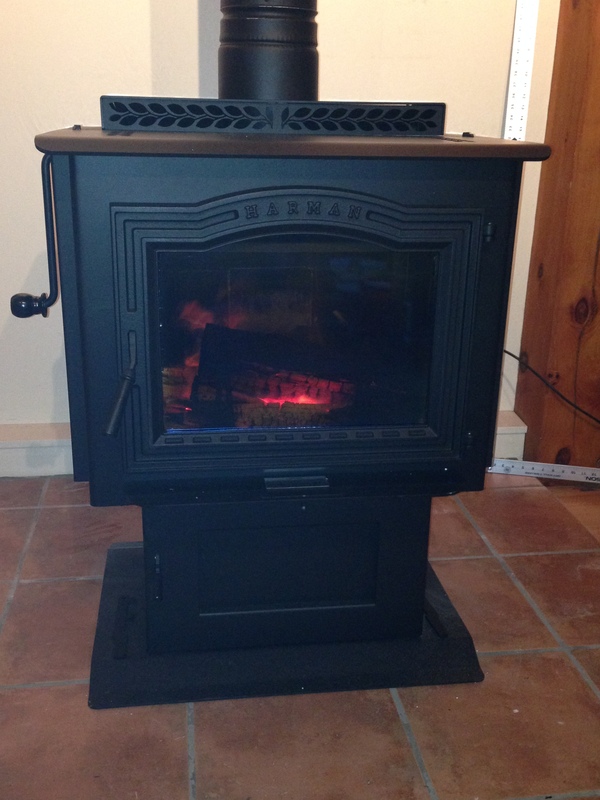 Our wood stove is supposed to be installed either tomorrow or Tuesday. The sooner the better! I can hardly wait. Let’s just hope it goes smoothly. My husband and I do not usually give each other gifts at Christmas. We tend to plan for and get what we need as the year goes along. Last October I invested in some really wonderful pigeons for John to add to his loft. So he decided that he wanted to do something special for me. 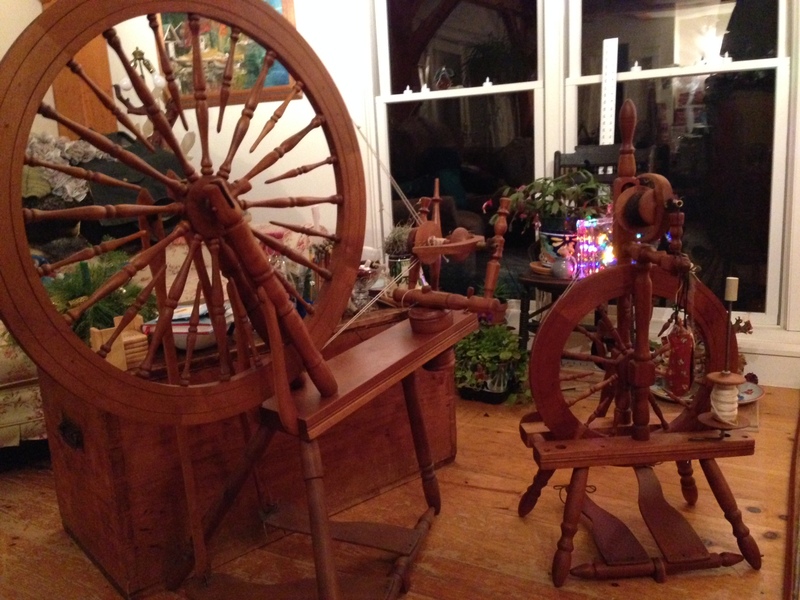 I have two Jensen spinning wheels, a 30″ production wheel, as well as a Tina II smaller wheel. (I take the Tina with me everywhere, and of course the big wheel stays home for other projects). 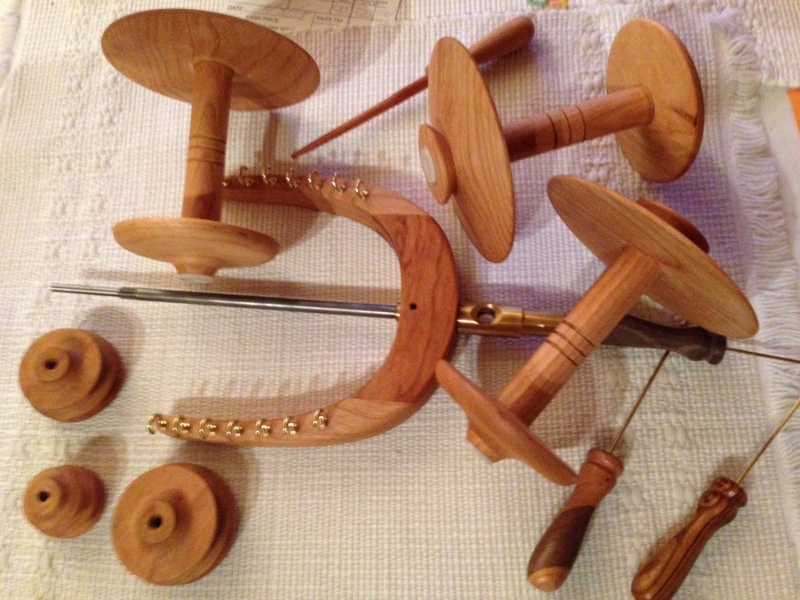 For a number of years now I have wanted to get some fast whorls for the wheels as I have been spinning a greater variety of fibers recently, and some of them are finer, necessitating faster spinning speeds. Getting a high speed kit was not as simple as ordering one online because of the age of the wheels. I was able to email and speak with both Jerry and his lovely wife Audrey on a number of occasions, and we finally got a plan together. I received the parts last week and am now in the process of oiling them before I get to try them out. But I am close! So this holiday was a little different than most, but it’s been a good one. I am psyched to get going with my new Jensen whorls. I have a stash of some cashmere, silk, and some combination fibers that I am dying to try out. I need to put some WoodBeams on the parts next, and after buffing I will be able to give it a go. Maybe as soon as this weekend :*) More to come on that! The week has been full of what they were calling a “polar vortex” last year. The term doesn’t seem to be as popular this winter, but it was a blast out of the arctic for sure. 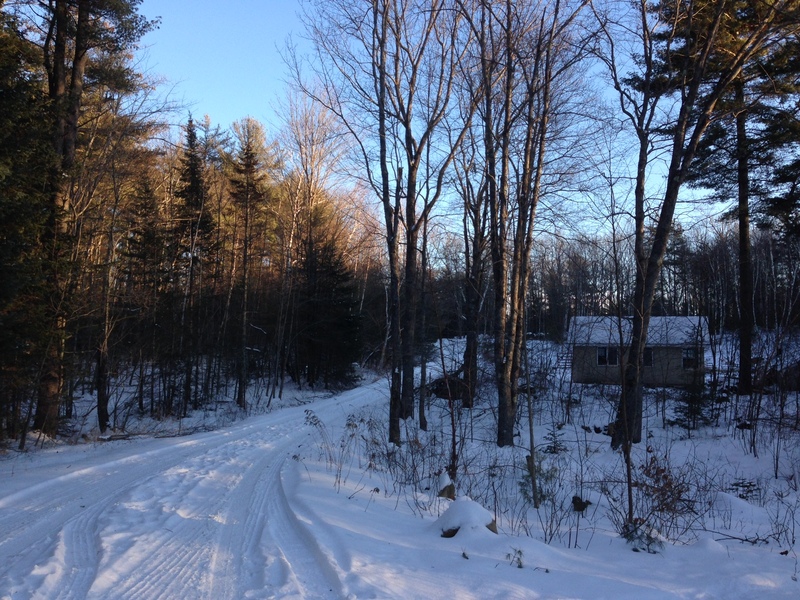 Minus 18F on Wednesday morning was most unpleasant. I had a sinus-like headache all day (I don’t think I kept my nose under my turtleneck very successfully, the wind was howling so badly nothing seemed to stay in place). These are the days when I wish I had a “real” barn structure instead of livestock greenhouses that can be problematic in high winds, which is what we had for the last few days. I only had to re-tie down part of the tarp yesterday afternoon when I got home from work, so it wasn’t too bad. 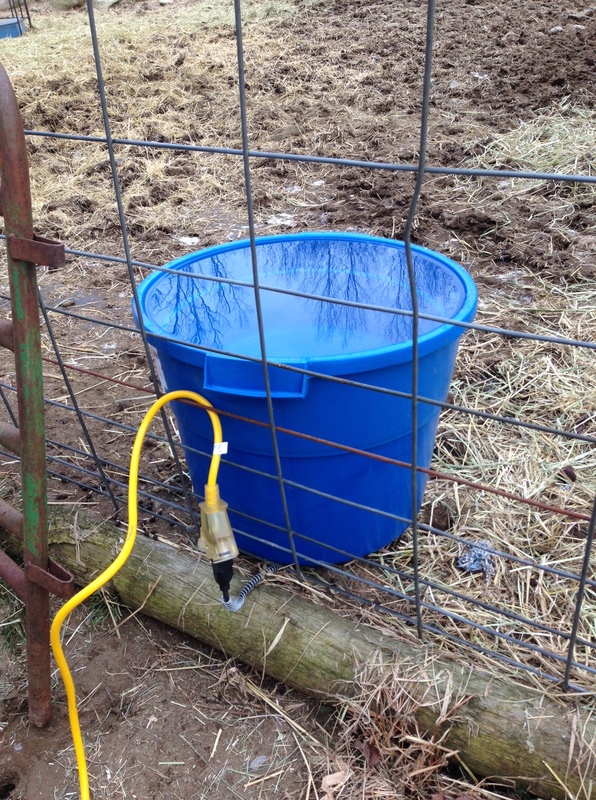 Happiness is a heated water bucket! 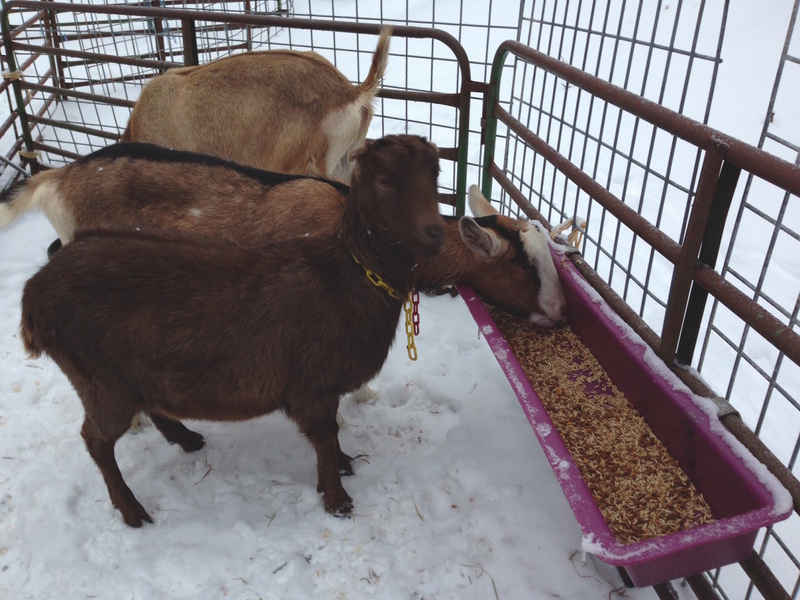 My real happy dance came earlier in the week when we brought home a heated 16 gallon bucket for the boys and Jingle the donkey. I have a large livestock water tank in with the girls which has a removable tank heater in it, but 3 bucks and a donkey don’t drink enough water to warrant a 30 gallon stock tank. So I have been “making do” with two smaller buckets, and ice whacking twice a day, plus hauling two gallons of hot water out 2 or 3 times a day as well. I feel like I am getting a vacation now that there is no more need for the sledge hammer and digging at large chunks of ice. 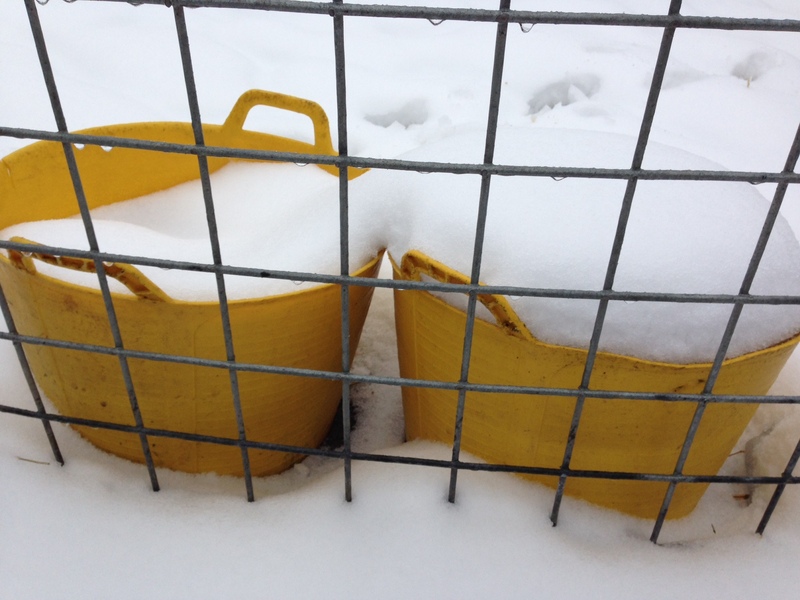 Old, unheated water buckets. For summer use only! It’s definitely the little things that can make life so much more pleasant! Elf in the foreground. One of my original girls. I had every intention of writing this post early in the week. But it’s been a tough one. The arctic blast has been hitting us this week with minus zero temperatures, and some wind that would stop a truck. And it was the “back to work” week after a very nice vacation. So up a little after 4 a.m. was quite a switch from vacation mode. But on Monday I had to rush right home so that we could load two of our goats into the back of the Subaru for the trip to the butcher. 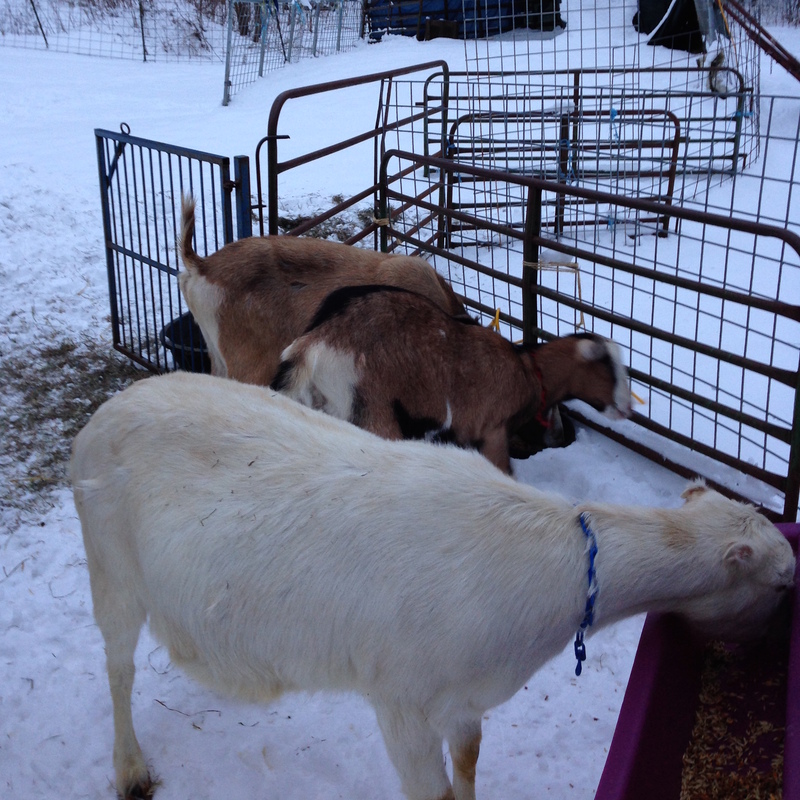 It was one of the more difficult trips as Elf, one of the first 3 goats that I brought to the farm, was one of the two. And the young male that took the trip with her was actually her baby. It was quite a low-key deal in the end. We did not have to stress about getting them into the car as they are all quite well-behaved, and all went without incident. We will have some lovely meat to share with friends, and lots of great memories of our Elf. I have been missing her this week, but we have her daughter Zelda (in the background of the photo) and Zelda’s girl Marigold to carry on that line. And so it goes. Elf will always be a sweet part and memory of our little farm. That’s farming. 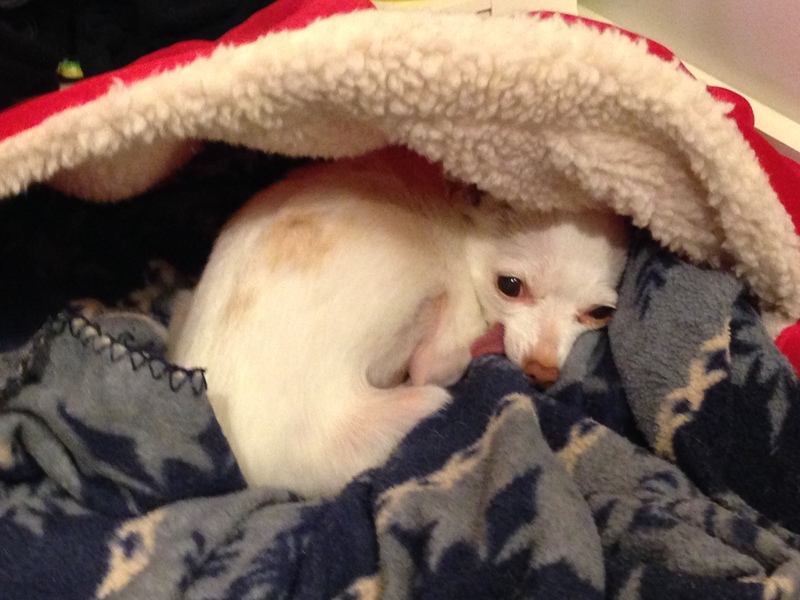 Tesser the Chihuahua moves into the new year with a new little dog cave bed. Good stuff! It’s really here! Another year has come and gone. I am not one to go all New Year resolutions in January as I prefer to celebrate the “new year” in the autumn, at Rosh Hashanah. But thinking about a new beginning, as the year reaches its darkest point, has some merits as well. I relish the opportunity to hunker down in the house, (hopefully with a wood stove soon! ), and get some serious knitting, spinning and reading done. To slow down and enjoy each day’s garnering of a few minutes more light. I have not been able to find which of my favorite bloggers quoted Charles Spurgeon last year with his “Begin as you mean to go on, and go on as you began…” line. But it’s how I would like to go into 2015, my 61st year (oh my! ), and take as much time with friends and family as I can, as well as trying to get enough rest. And the topper would be making sure that I build enough time into my mornings to really whip my spinal arthritis and bursitis hips into movable shape! That takes more doing these days, and with all the chores and getting ready to get out the door by 6:15, I don’t always take the time. Hopefully I will be more mindful of that, so my days are more productive and full of the things I want and need to accomplish. I think I need to take a leaf out of a good friend’s book: mindful focus. 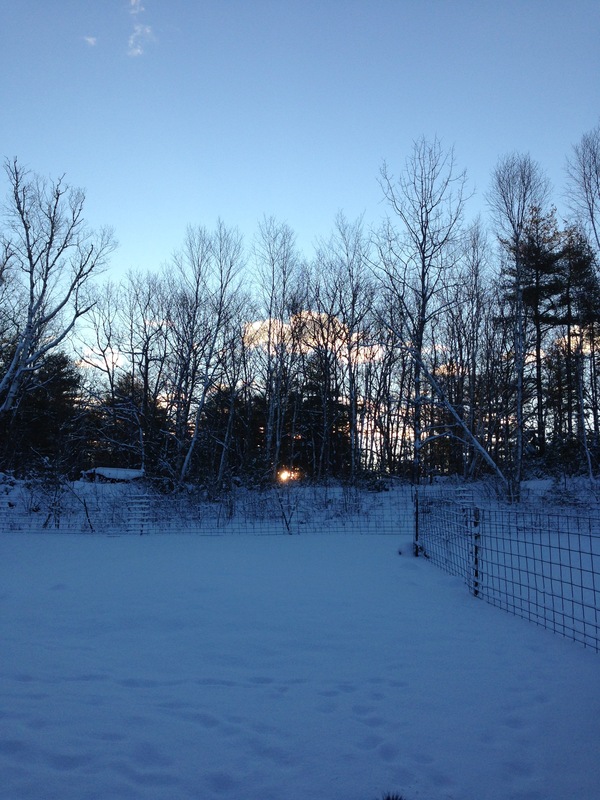 (Kris writes a wonderful blog, Losing Sleep, Counting Sheep . Take a look, it’s a great read). I think that mindful focus really sums things up quite nicely. And so it goes! Happy 2015 to all of you.